Happy New Year to you all. First, I’d like to share that I am grateful for your interest in my blog: this past year’s feedback turned out to be very encouraging, innovarista.org registered about 11,000 views and @innovarista shows in excess of 77,000 impressions in 2015. These numbers are fairly modest and won’t “break the Internet” : ) but they do exceed initial expectations and fully justify the effort. Besides, I really enjoy all the conversations and emails that follow some of my posts, all incredibly insightful. That alone makes any time I spend on blogging worthwhile. Thanks again. By the way, I picked up my new NOKIA badge just yesterday. I am proud to continue to work with some of most talented individuals and innovative teams in high tech. NFV, Network Functions Virtualization, and all the work with the Cloud Innovation Center remain my job’s main focus. Stay tuned. One can only feel humbled about all of that as well as other very rewarding opportunities such as joining MIT’s and IIT’s Boards serving IDSS, a new Institute for Data, Systems and Society, and the Entrepreneurship Center respectively. I would also like to show my appreciation to those involved in IIT’s Real Time Communication conference and IEEE’s CQR, Communication Networks Quality & Reliability. 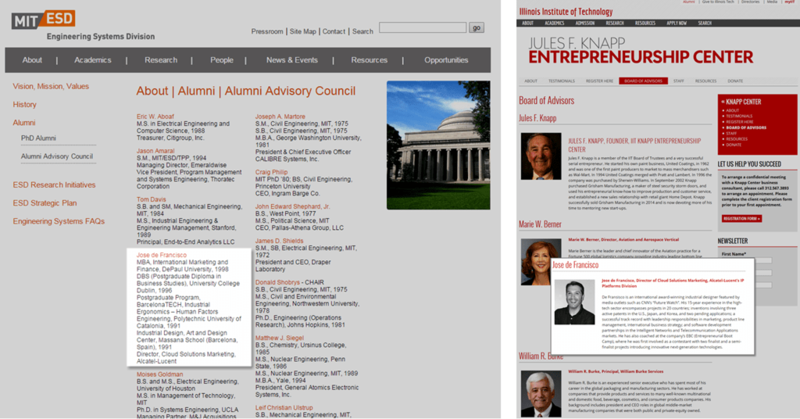 LEFT: MIT Engineering Systems Division. RIGHT: IIT Entrepreneurship Center. I took the above winter wonderland picture in my neighborhood. See you in Barcelona’s wormer climate at Mobile World Congress in just a few weeks. Wishing you the best for 2016 and beyond! Alcatel-Lucent @ IIT Real Time Comms. 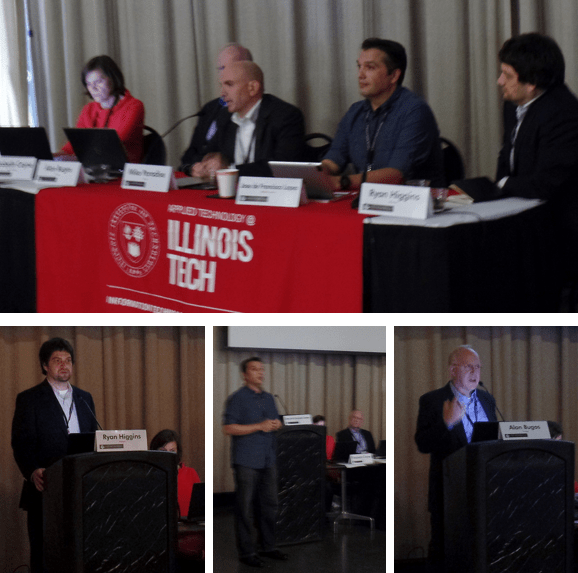 Alcatel-Lucent’s Naperville team fostered our partnership with Illinois Tech (the Illinois Institute of Technology) by joining an impressive list of sponsors and contributing with speakers to the Real-Time Communications Conference’s 10th Anniversary. As in past editions, Carol Davids, Conference Chair, and her team managed to deliver one of the best regarded technical events in this fast evolving space. I took these pictures at Ted East’s keynote. Ted is the Vice President of Alcatel-Lucent’s CIC (Cloud Innovation Center). His presentation was centered around a live demonstration illustrating a step-by-step deployment of a sophisticated end-to-end solution comprised of an EPC (Evolved Packet Core) and IMS (IP Multimedia Subsystem) with both being onboarded in real time as VNFs (Virtual Network Functions) on a CloudBand Node. The node performed as a multi-app-tenancy environment and is equipped to be set up in a highly distributed architecture. CloudBand is also well known by its Management System, this is the common platform orchestrating and automating the VNFs’ life cycle. 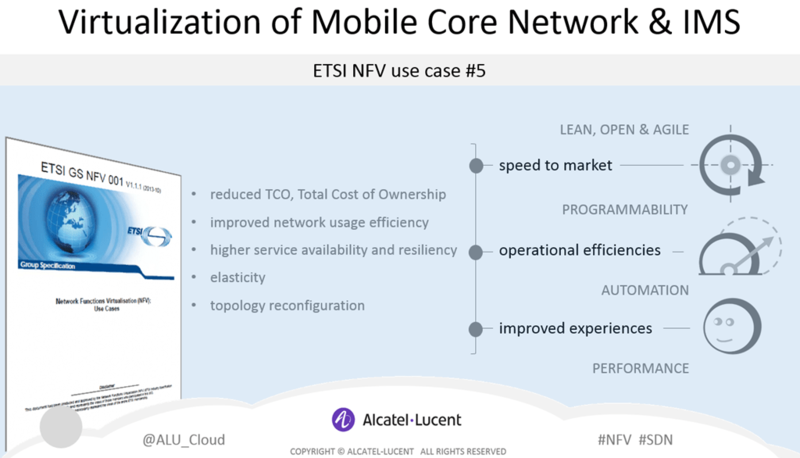 I will refer you to ETSI NFV Use Case #5 on the Virtualization of the Mobile Core and IMS if interested in more background information about the demo’s purpose. 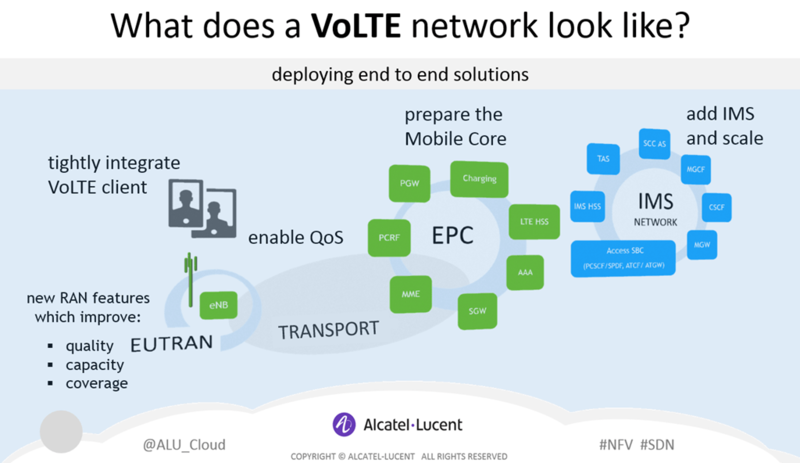 The end result was a live VoLTE (Voice over Long Term Evolution) service that network operators can now deploy and right scale at a fraction of the time when compared to conventional architectures. Ted was then able to browse the internet and make a voice call using 4G’s mobile broadband capabilities and IP (Internet Protocol) on the spot. This demonstration also illustrated NFV (Network Functions Virtualization) and SDN (Software Defined Networking) working together as other applications were added, such as Anti-Virus and Parental Controls to name two examples. Traffic was dynamically routed to best manage network capacity. Ted’s talk was one of the highlights of the Cloud Track, which I co-chaired with Alan Quayle and greatly benefited from Warren Bent’s tireless support, the conference’s Content Director. Ed Elkin, Anne Lee and myself delivered talks in break out sessions covering VoLTE, WebRTC and NFV respectively. Are telcos right to be concerned about performance in a virtualized world? What can be, or is being, done to mitigate those concerns? What technologies are in the pipeline that will help address performance concerns? Can open platforms provide the requisite security for a telco environment? Does their open nature make them more vulnerable? What are the implications of openness? In a virtualized world, is the reliability of software more important than the underlying hardware’s reliability? How does open source help the cause? How are scalability issues being addressed? Is it more of a hardware or a software issue? How will the evolution of NFV colliding with movement towards the cloud play out? What are the most critical implementation issues when deploying VNFs? Will network PoP be easily transformed into data centers? How can data center operators ensure the feedback loop to support service guarantees? Do telcos have the skill set to be able to support NFV? Do you think that NFV, along with SDN, is an opportunity for architects to think about networking differently? Here is a quick note to share that Elizabeth recently launched The New IP. Light Reading’s new site focuses on the business of managing and orchestrating state-of-the-art virtualized IP networks. The blogging team includes other well known industry analysts such as Ari Banerjee, Caroline Chappell, Tom Nolle, Carol Wilson and Ray Le Maistre to name some. By the way, a big thank you to those of you who followed my session on NFV Economics after having to reschedule from Tuesday’s “prime time lineup” to Thursday’s “last talk of the conference” due to a last minute scheduling conflict on my side. I would also like to thank Nokia Network’s Andrew N. Rollins most sincerely for his very kind introduction, which I am humbled by, and for allowing this business case talk to take 60 minutes given the attendees’ interest (instead of just using the 30 minute slot set for this session). 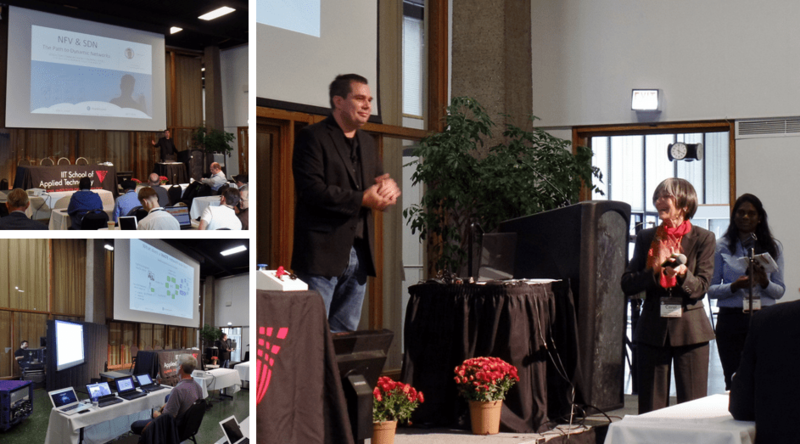 Alan Quayle’s blog: IIT RTC Conference 2014 Summary. Chad’s WebRTCHacks’ blog: Building Consensus on WebRTC Q&A with W3C Editor Dan Burnett. 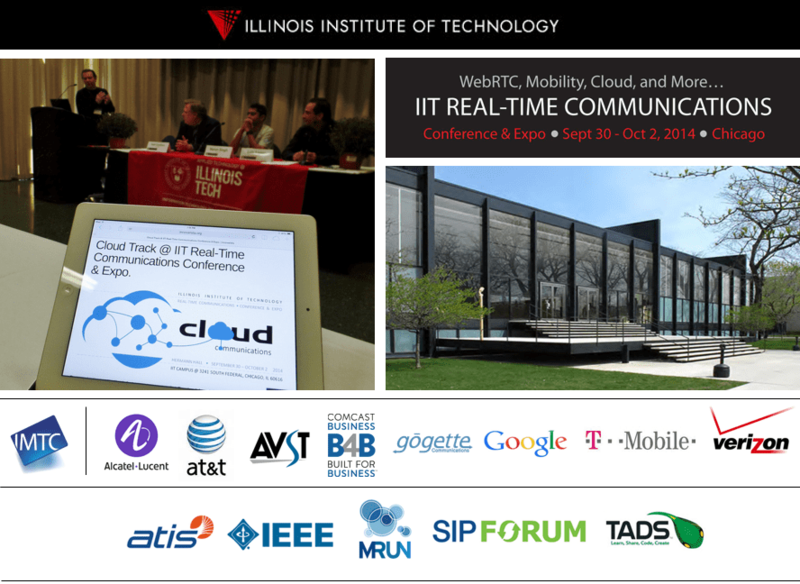 IIT’s event site: Real Time Communications Conference & Expo. Mobile Networks, Platforms and Applications – Maureen Stillman, Mission Critical Wireless, and Chris Mayer, Solstice Technical Consulting. Web & Emerging Technologies – Alan Johnston, Avaya. Next Gen 9-1-1 and Regulatory Policy – Bernard Adoba, Microsoft. Internet of Things – Sateesh Adepally, Cisco. I’m posting this without further delay and will get back to add some more hyperlinks later on.